Would your church, business, or group like to host an event at The W? We offer options for renting the pool, wet classroom, rock wall, tennis courts, racquetball courts, Fieldhouse, and Center Court. For more information, contact Heather Zajicek at 319-352-8717. Wet Classroom: $15 for the same two-hour time period (member and guest rate). This room may be used for treats and opening presents. A $50 deposit is required. After tables have been cleaned, garbage thrown away, and floor swept, the deposit will be returned. Large Pool Parties: 16-60 people swimming will be scheduled after normal business hours. The cost is $215.00 for a two-hour time period, and the party room is included. Large pool parties are scheduled after normal business hours on Saturday nights, 6:30-8:30 p.m. Other times are available but limited. Pool Parties may be booked and paid per person: Children are $5 and adults are $10. The Wet Classroom fee is $25 per hour. A $50 deposit is required. After tables have been cleaned, garbage thrown away, and floor swept, the deposit will be returned. Payment and deposit are required at time of booking to secure the date and time. Cancellations may be made seven days prior to scheduled date. Payment for the party is due seven days before the party date or time of booking. Members may charge to their account if auto payments are active on their member account. For information regarding other small- and large-group rentals, call 319-352-8717. Food/drinks can be ordered through Wartburg Dining Services or you may bring in your own cake, drinks, or food. Children 5 and under must be within arm’s reach of a supervising adult whenever they are in or around the water, with one adult for every child. An adult or patron 12 or older (in appropriate swim attire) must accompany all 6- and 7-year-olds in the water. If a minor is supervising the child in the water, an adult must be in The W. One adult in the water can supervise up to four children. Children 8 to 12 may be in the pool area alone, but a parent or guardian must be in The W. A parent or guardian must check the minor in with the lifeguard prior to leaving the pool area. Children left unsupervised will be dismissed along with the person responsible for their supervision. No running, pushing, or horseplay is allowed in or around the water. Patrons must be 48 inches or taller to ride the slide. Catching and double riding are not allowed. 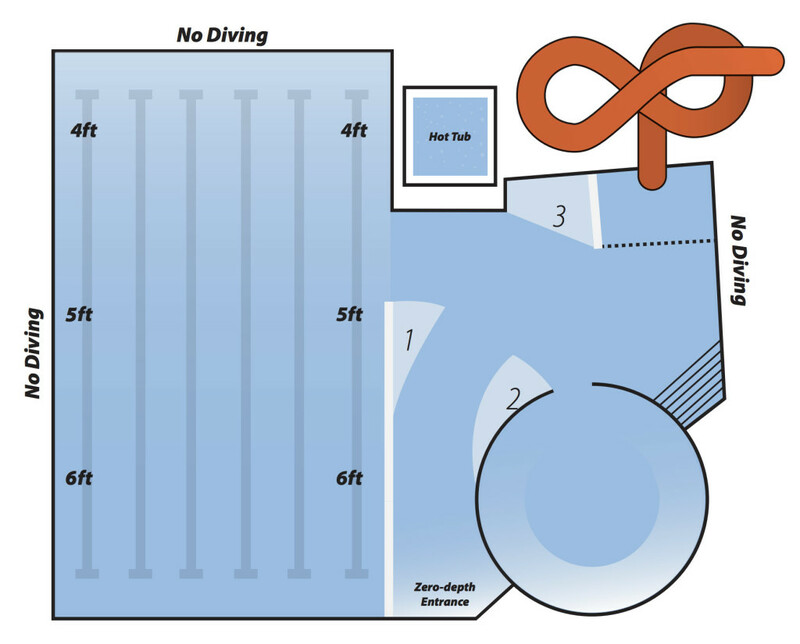 Be aware of all underwater shelves in the pool (marked 1, 2, and 3 on the diagram). No sitting or standing on the pool ledges. No diving in marked areas. Patrons must be 4 to use the hot tub and those 14 and younger must be accompanied by an adult. Non-swimmers must pass a swim test to use the south half of the pool. Poster tack acceptable for hanging posters or signs, ect. Food/drinks can be ordered through Wartburg dining services or you may bring in your own cake/food and drinks. Do not open or touch aqua carts stored in wet room.